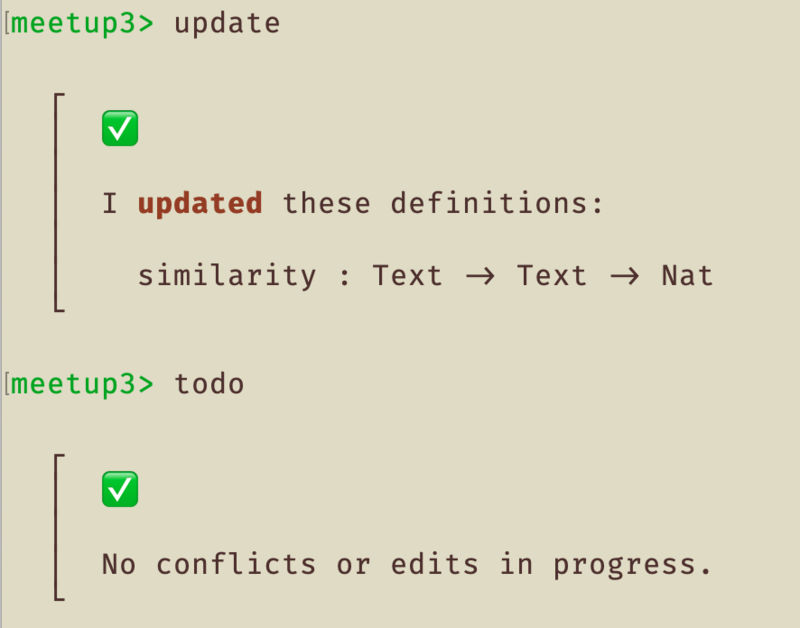 The edit command writes the text of the specified definition to disk for you to review or update. Gone are the days where changing a function signature produces a cascade of unhelpful error messages from across your entire project, where fixing one error causes seven more. 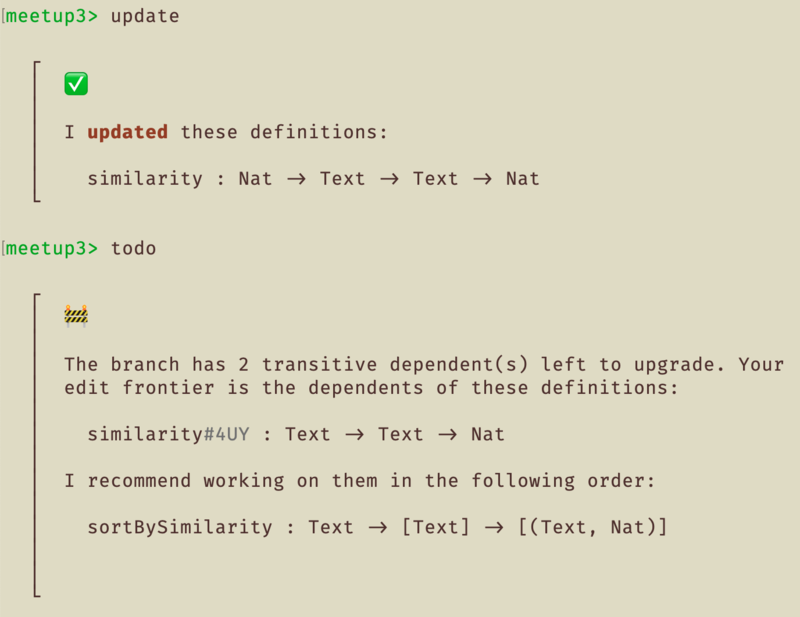 Unison will support a number of structured refactorings, the first of which is simply: definition replacement. 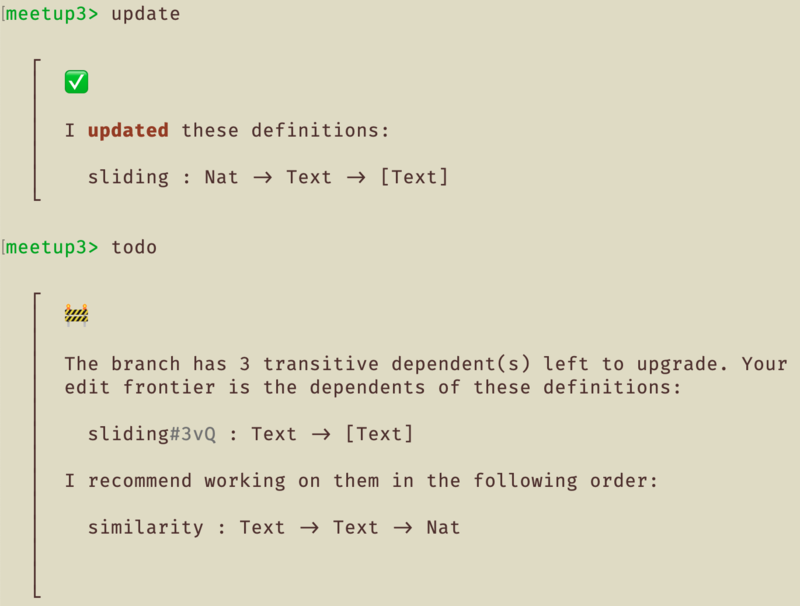 From this output, we can see that this update has three transitive dependents. This is the maximum number of definitions that you could need to audit or update as a result of the change. More importantly, this number only goes down as you work! We’ve added a preliminary IO ability, and are in the process of implementing a native handler for it in the runtime. We have also added the execute command to the codebase editor, which will evaluate IO expressions, such as your application. Eventually, you’ll be able to start your application from the shell as well, by passing command-line arguments. The IO functions will likely use this eventually! 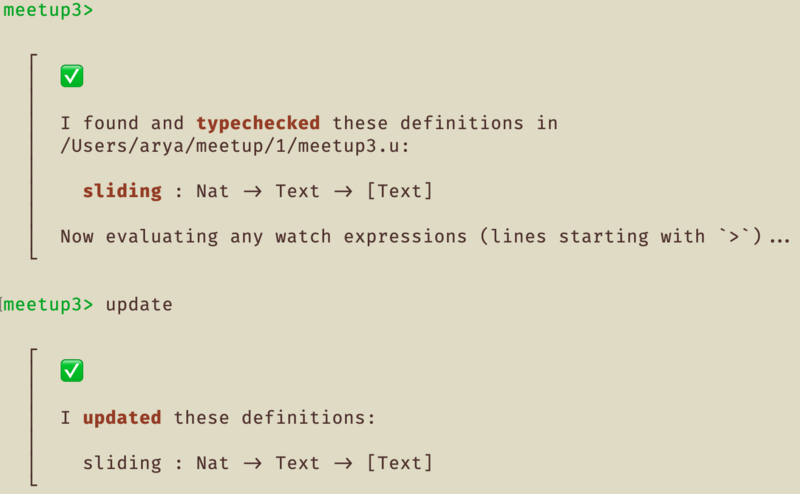 The implementation works for all types, comparing values structurally. 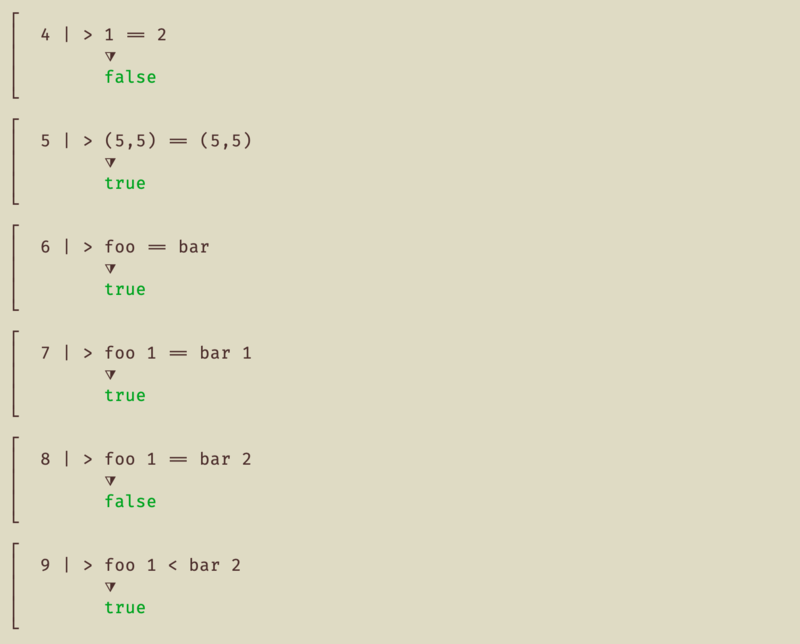 Even functions! 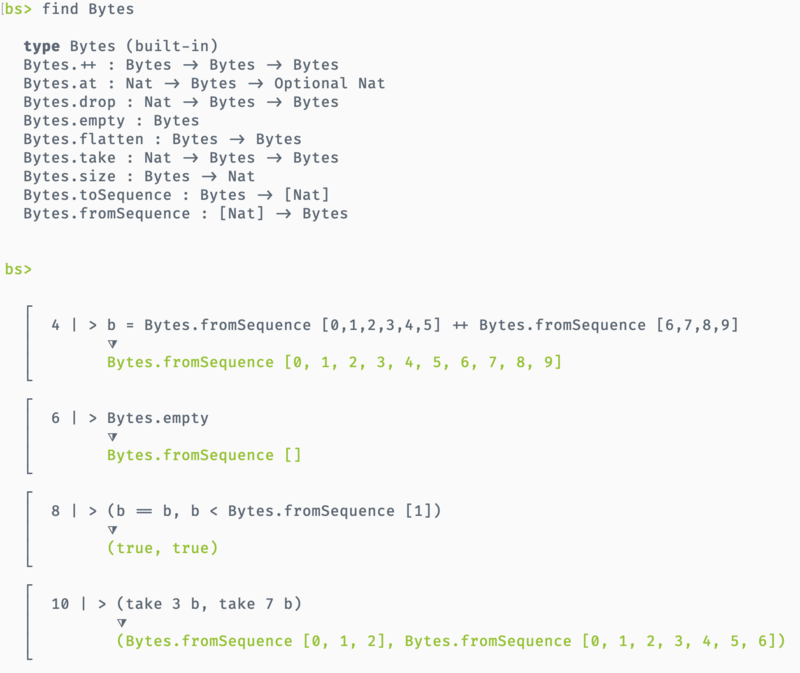 We will probably do something in the future to give these a more constrained type and get our free theorems back. We’ve fixed a lot of bugs. 😅 Thank you to the masochistic handful who’ve been using the tool and reporting them, and special thanks to @noahaasis (#328), @francisdb (#333, #392) , @mrziuban (#382, #385), @benfradet(#418), for their fixes. https://github.com/francisdb/unison-json - JSON AST / parser / printer, written in Unison. https://github.com/BenFradet/vscode-unison - Unison syntax highlighting for VS Code. 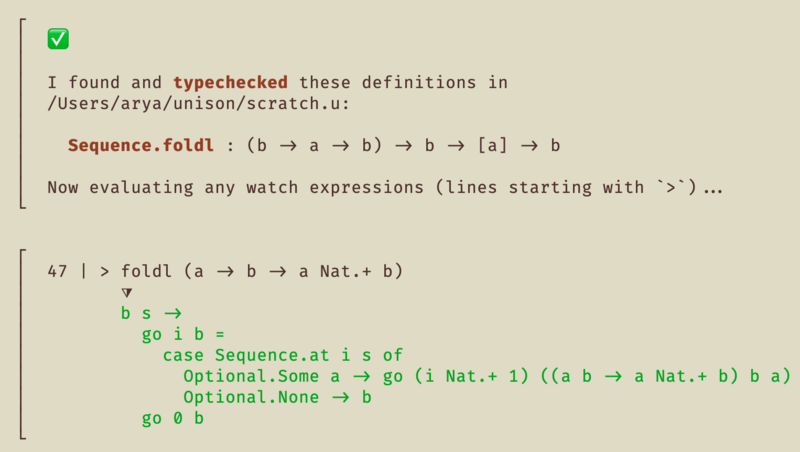 Today, any two Unison types are the same if the (multi)set of their constructor types is the same. We’ll be introducing new-types and opaque types. There are so many rough edges, but we’ll get them one by one. Thanks for reading, and keep the comments coming! Especially, let us know what you need to start your Unison-based project.